Paraguay will have a worthy representative at the Platino Awards of Ibero-American Cinema. Derlis A. González will be seated among the nominees in the Best Original Music category for movie "The Gold Seekers" at Mexico. CANCUN, Mexico - April 24, 2018 - PRLog -- Along with great exponents of this art as Alberto Iglesias (The Summit of Argentina, Spain), Alfonso de Vilallonga (The bookstore of Spain), Juan Antonio Leyva and Magda Rosa Galbán (The Roof of Nicaragua, Cuba) and Plínio Prophet (O film da minha vida from Brazil); Derlis A. González is nominated for the prestigious international award for the Paraguayan film The Gold Seekers (http://www.losbuscadores.com.py/). The musical aesthetic that accompanies the images obeys a criterion that contains various sensations. "Basically, the directors wanted an adventure music score with a balance between different genres. The story has many funny moments, but it is not a comedy. 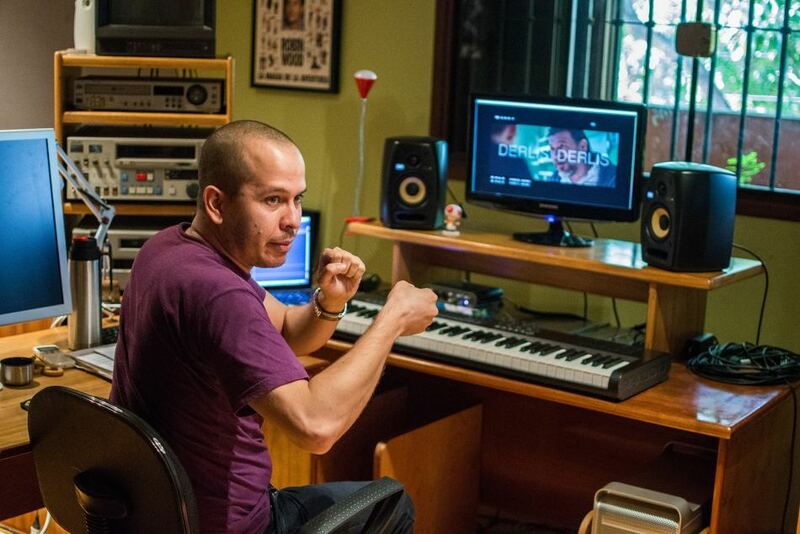 It has tense moments and action, but it is not violent either; however, it is very intense ", explained Derlis A. González, composer of the soundtrack, who has more than 20 productions in his reel. "The important thing was to achieve an identity from the musical point of view, so the idea of ​​doing it with an orchestra arose; a lot of percussion, quite tonal and simple in its form, thus supporting the plot," says Derlis. "Writing everything took about two months, and the rest of the time we focused on editing, post-production and live music. I put the pieces in the scenes and showed them to the directors. They told me what worked and what did not. " In a historic day for Paraguayan music, more than 70 musicians from the National Symphony Orchestra (OSN) recorded the score prepared by Derlis for The Gold Seekers. "Once the musicians arrived and started playing they added another flavor. Extending his happiness by being part of this project, playing my melodies, was unmatched," says the young man, who studied classical guitar at the Paraguayan National Conservatory of Music and toured prestigious schools in Canada and the United States, as well as private classes with great exponents of the musical category related to the seventh art. "There are some scenes in which specifically [the directors] wanted a classical guitar solo. I wrote it and, when they heard it, Tana said: 'We're going to ask Berta to play that part.' I almost fell off the chair. I thought that only one Berta could be," says, acknowledging that he composed a piece for the Latin Grammy-nominated classic guitarist, Berta Rojas. In his acceptance speech (https://www.facebook.com/PullerCameraCrew/videos/20011983...) for an honorary award at the announcement ceremony for the Platino Award nominees, the president of the Hollywood Academy of Motion Picture Arts and Sciences John Bailey, mentioned Derlis and directed praise towards the Paraguayan film The Gold Seekers. "It's an incredible film," Bailey said about the Paraguayan movie, which he had praised in January when the film was presented at the Palm Springs Festival in California.